Hooray it’s Holy Thursday, Easter has arrived! Everyone’s looking forward to the nice long weekend but what can we do for the kids to make it an EGGcellent Easter??? Shopping Centres around the Country have lots of activities going on and better still, it’s all FREE! So why not pop down to your local retail shopping centre this weekend fun filled entertainment for all the family! 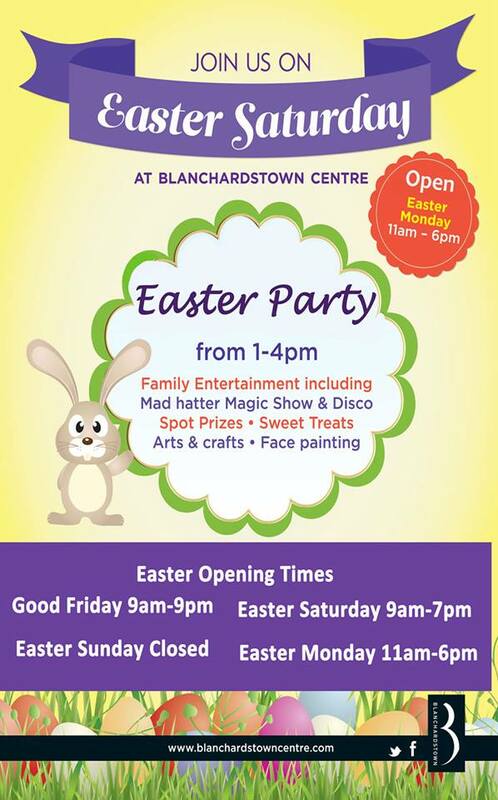 Blanchardstown shopping centre have set up a kids club for the week of easter with a range of activities including magic shows, grufffolos and an Easter party on Easter Saturday as well as mid season sales in a number of stores for mum and dad! 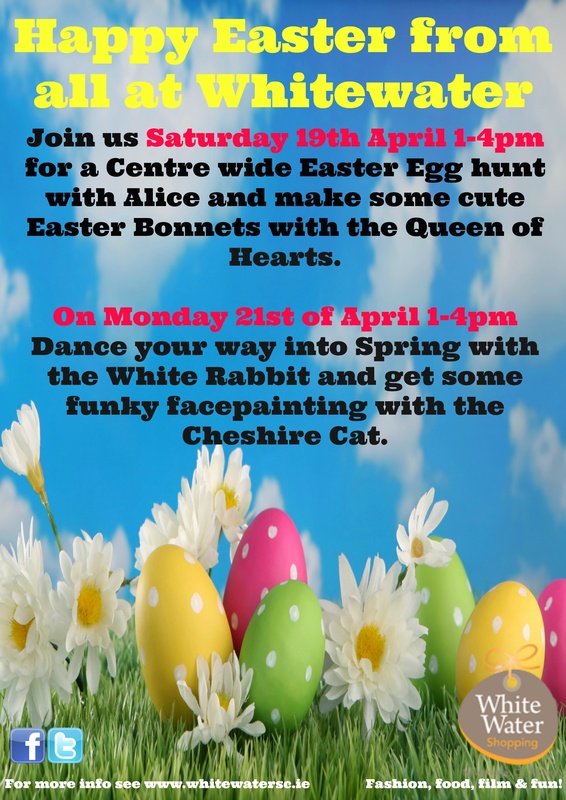 Join us on Good Friday & Easter Saturday for some Easter fun! ​Our Easter Fun Club will keep your kids entertained this Easter weekend, so come along to level 1 between 2pm & 5pm and join The Mad Hatter for our magic show, puppet show, and maybe even have your face painted! YAY! The Mad Hatter will do his very best to call upon his friend The Easter Bunny, so if all the boys and girls are very good, he might pay us a special visit! Lots of fun activities for the Kids! This treasure hunt around the centre will encourage families to find clues to win prizes of courses from Leapfrogs, Gymboree, BabyChi and Fota Family Passes PLUS Lindt Chocolate Bunnies from 10-18th April. Entry forms available at Customer Services. Art Workshop: The Farmers Market will host an Egg Decorating activity on Thurs 17th April. 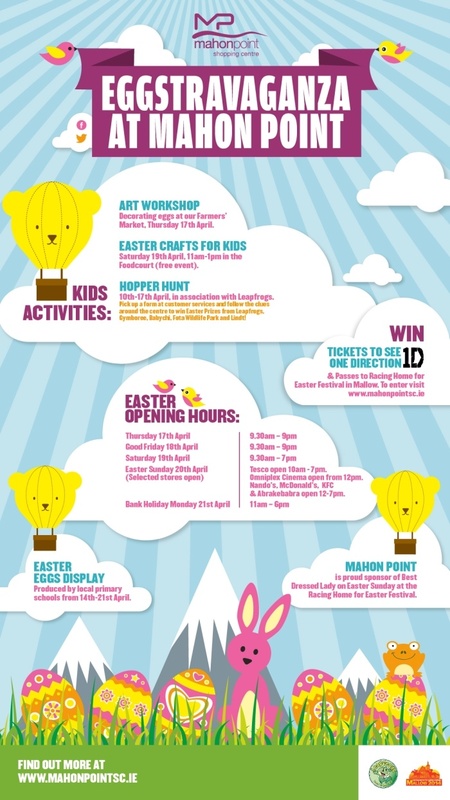 Crafts for Kids: Join in the FREE crafts for Easter in the Foodcourt 11-1pm on Easter Saturday 19th April. Web Competition: Competition to win concert tickets for One Direction and Race Day Tickets for The Mallow Festival- Coming soon! Best Dressed Sponsor: Mahon Point is sponsoring the Best Dressed Lady on Easter Sunday at the Mallow Races. Our Style Advisor, Dee Kelly Morgan will be judging the talent! Join us for an Alice in Wonderland themed Easter fun, free events for all the family. The Easter Bunny Fun Photo Club will be here on the mall and in the stores on Thursday, Friday & Saturday from 11.00am – 5.00pm. See if you can find the Easter Bunny and get your picture taken. We will display your picture for a week or so and then you can pick it up from us and its FREE. Happy Easter from the Easter Bunny at Navan Town Centre. The Easter Bunny will be giving away up to one thousand FREE miniature eggs on Easter Saturday and there will FREE face painting for all young children. Easter Monday from 2-4 p.m. there will be a FREE puppet show and face painting. The Easter Bunny and Giggles the clown and their friends will be in Parkway on Saturday from 12 noon to 3pm. There will be a treasure hunt for Easter Eggs, and JP Dillon and the Shadow Crew will also be here. Free entertainment, and free Easter Eggs.